In my crazy redesign frenzy of late, I came to the conclusion that we needed a new sofa. HA! But not just any sofa. I’m kind of picky. For starters, we need (well, I suppose this is actually categorized as a want) a sectional. Ah, that very thought sends me in a bit of tizzy because it is a big deal to get a new sofa! And wanting a sectional just adds a dozen more choices and measurements to the mix. It isn’t something you want to be hasty about bringing into your home,. My head has been spinning just thinking about it all! But, that is the season we are in right now with our house undergoing a little reorganization and metamorphosis. Decisions need to be made! We’ve had three sofas in our married life, each has had its pluses and minuses. Our current sofa, the Pottery Barn Basic with white slipcovers, was a happy Craigslist find quite a few years ago. I searched regularly for Pottery Barn furniture and was the first to call when this sofa came up! It has held up great in spite of it being “used” when we got it and now subject to Jack’s daily destruction and antics. The down-filled back cushions are quite floppy and sloppy looking now, but I might have them refilled at some point. I eventually bought a new slipcover from Pottery Barn (they were a floor sample but still brand new) and it has lasted through bazillions of washings, so that is a big plus too! Yes, they do require regular washing and they can look pretty shabby in between, this is true. But I’ve grown to appreciate the washability of slipcovers even more since we’ve had Jack. At least I know I can whip the slipcovers off and have them fresh and clean again in a jiffy! 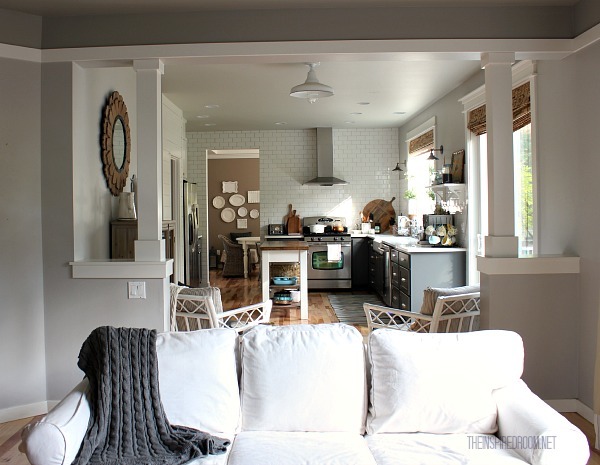 You can find the truth about my slipcover experiences (pre-Jack) and tips here. We are going to keep this PB sofa in spite of the issues with white slipcovers because overall it has worked well for us in our family room, even with Jack. We might actually get a new slipcover for it in something other than white. We’ll see. ***Update: We have decided to make some changes with our white slipcovered couch. See my post here sharing my experience of having a white slipcovered sofa with dogs! Our well-loved and rather expensive first sofa was a Thomasville Country Inns and Backroads love seat. I adored it’s English Country style back in the day (the 1990’s). While the upholstery is dated, I covered it at times with white ready-made slipcovers or just added tons of pillows to somewhat disguise it. It has been in our home for probably 19 years or so, so it lasted a good long time. It is a classic shape so it could easily be slipcovered and still look great if I had a need for it. While the down cushions became flat and in need of refilling, the structure held up great through a half dozen moves, three kids and two dogs. The dark upholstery was a bit of an issue from the beginning, though. My kids would catch a cold when they were toddlers and then would bury their faces in the comfy sofa. Before I could stop them, they would wipe their noses right on the sofa. I could never really get those slimey snot smears clean. Glistening snot smears on a dark forest green sofa was really not OK with me. TMI? Ha! Now you know why I’m a slipcover fan. Machine washable is good! Before the Pottery Barn sofa and after the Thomasville one, we bought a leather sofa for our family room at an antique reproduction store. I don’t seem to have a picture of it, but I loved the look and “realness” of leather and my husband loved the manliness of it (and Ralph Lauren was always a favorite of mine!). What I didn’t like that I couldn’t keep pillows or blankets from sliding off. Drove me nuts to see my pillows on the floor or slipping down all the time. I like versatility in decor and not being able to add throw pillows was slightly frustrating to me. And I didn’t like that leather was cold when you first sat down. Picky much? HAA. Yes I kind of am. In this season of reorganizing how we use our home, I had another room re-purposing idea! LIGHTBULB MOMENT! And it was brilliant. And it involved another new sofa, but this time a sectional as the foundational piece of furniture that will make this new space work for us. Thus, our first experience in shopping for a sectional! So where are we putting a sectional and why are we getting one? While I won’t take time today to explain the all details as this is already going to be a long post, suffice it to say we’ll be repurposing a little used bedroom. We want a space for our son and his friends to hang out to play video games and watch movies and just hang out in our home. We are big believers in giving kids a comfortable space for friends (if you have it available!) so they’ll WANT to bring their friends home and hang out at home. It worked wonderfully with our girls through their teen years and we want the same for our pre-teen boy. Plus, we’d like to host more family parties at our home and having a secondary hangout for kids (or the guys, as the case may be!) is a real plus. Fortunately we do have the space available with just a little bit of repurposing. We decided that the key to the success and function of this new space is going to be the sectional. Even though the room is not that big, a sectional should work great in the room. Too many pieces of furniture can look awkward and crowded in a small space. I’m really trying to get rid of stuff lately so being able to seat more with less pieces in a room excites me. A sectional would not only maximize the available seating and floor space but it would set the purpose of the room, which of course will be all about comfort and entertainment! What were our main qualifications in choosing a sofa? We wanted a sofa that feels like a COZY blanket (heh, yes, those were our exact terms), in a modern style but still a traditional shape (nothing that would look too trendy or too dated in a few years) and is comfortable for several people to sit or even lay down on. We wanted a solid velvety feeling solid neutral performance fabric that was easy to clean but that we could dress up and change the look of with pillows. Since it is in an upstairs family room, the style of it wasn’t actually as important to me as the function and comfort. We also wanted a pull out bed for sleepovers and for when we have extra guests. Affordability was also huge on our list of considerations. Right about the time I was researching my options for a new sofa, I got an email from La-Z Boy wondering if I might like to review a sectional. At first I didn’t think I was interested because I don’t really do many product reviews (unless they are awesome, of course!). I am so picky about most of my furniture I wasn’t about to say yes to something I really didn’t like, even if they sent it to me free of charge. Free isn’t worth the hassle if you hate it, right? Eventually I looked up La-Z Boy online and found that they had some great styles and lots of fabrics to choose from. When I realized there was a La-Z Boy store in my area I popped in and talked to a really nice salesman there. Ok, so I grilled him and took over the store for an hour or more sitting on all the furniture and asking questions. What types of questions did I ask about the sofa? In purchasing our first sofa, the Thomasville, I asked all the expected intelligent furniture shopper questions about frames and construction of the springs, like Is it 8 way hand-tied? They were good questions. But this time around I remembered Consumer Reports saying that question was not as relevant any more. Disregard the term “eight-way hand-tied springs.” It’s no longer synonymous with comfort or high quality. Other types of springs–coil, cone, S-shaped, and grid–can be just fine; they mainly influence how comfortable the sofa feels to you. So, instead, I dove right in to more practical everyday concerns. Like, “What would happen to the fabric if a dog barfs on it?” Or, “What if a toddler wiped his nose on a cushion?” You know, day to day issues when you have kids and pets. Sorry to have to bring that up particularly if you are not a mom or an animal owner, but trust me, it is important to know. 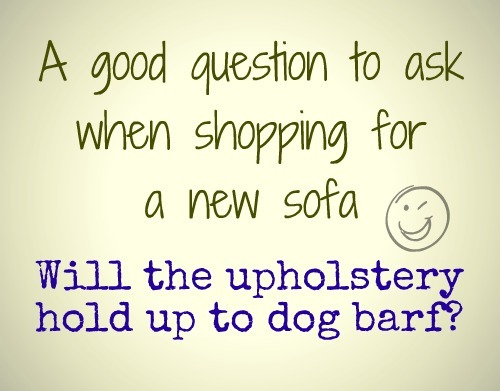 Questions I didn’t think to ask before we had kids and dogs destroy sofas. To figure out what to ask before you buy, think about how your family lives and how your sofa might be affected. Then ask the common everyday “what if” questions that might apply to your family now or in the future. Knowing about the construction is helpful as you evaluate what sofa is right for your family circumstances and budget. Be sure to ask about the warranty, as well as the option of fabric protection. And of course, ask yourself if you will still love this sofa style and the fabric in several years. If you decide on a more trendy shape or fabric, are you OK with it feeling dated before the sofa will wear out? By the way, our salesperson was kind enough to assure me even dog barf would not destroy my choice of fabric. My salesperson patiently waited as I sat in every sofa. I analyzed their shapes and measurements. I considered regular sofas and chairs and sectionals too. I touched and stared at every single fabric and leather sample. I carried fabric samples around to see them in different light. When I found a fabric and accent pillow fabric I really liked, I brought it home and rubbed it all over Jack’s fur to test for the likelihood of it attracting dog fur. I ran water on it to see what would happen when liquid was spilled on it. I visited the store several times in a two week period of time. I wanted to be SURE this sofa was worth trying! So did I order the sectional? YES! When it passed all my critical and highly scientific tests and questions, I decided a La-Z Boy Collins sectional would be worth bringing home to meet my family! 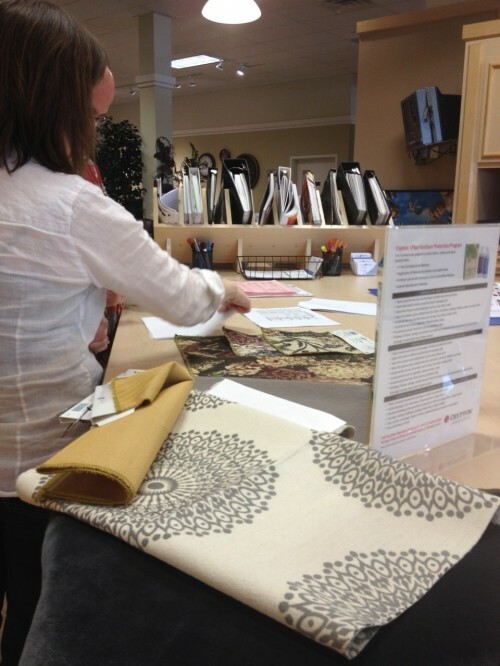 You can see a sneak peek of the accent pillow fabric I chose in the photo above (the one with the round medallions)! The sofa fabric is a solid neutral. I’m really excited about having a designated kid zone family space that can still look put together and pretty. I’ll be sure and let you see it when it arrives! And I’ll definitely share what I think of it and how it works out for us. 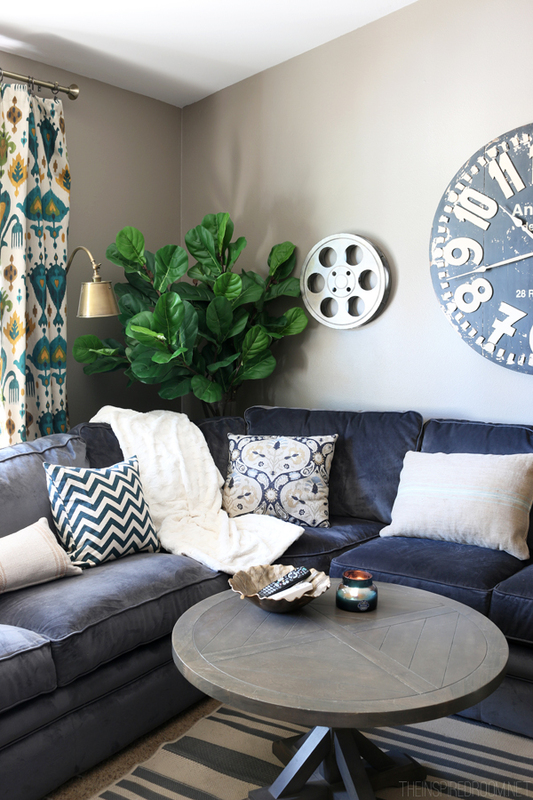 And of course you’ll get to see my upstairs family room transformation! *Update: above is the sectional I ended up choosing! See my post when I got it here, and when I added ambience with wall sconces here. What are your top considerations when you are looking for a sofa? Do you have questions you like to ask before buying? La-Z Boy is providing me a sofa but my opinions and experience with it are my own. 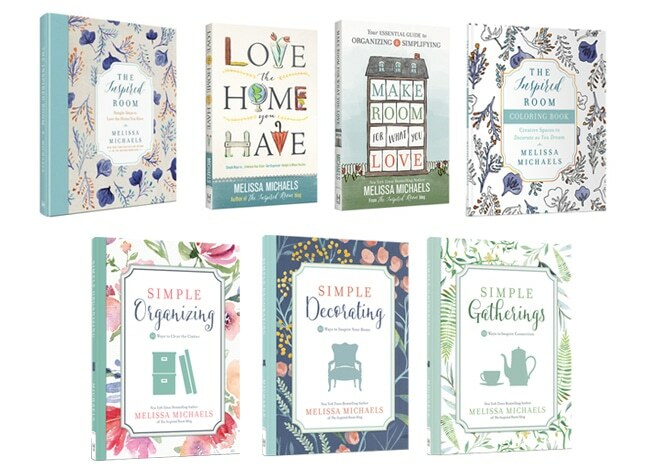 Check out my bestselling decorating and organizing books here! We went through a similar process when we bought our sectional. The day we closed on our house we realized that our sad, used couch wasn’t going to “fit” with our house and since we have people over more often than not, we needed a lot of seating. It also helps that our living room is long and kind of narrow – so the sectional “fits” the room without being too big. We also have a dog and 2 cats so it had to be fabric that could deal with dogs, cats, multiple people, comfy enough to nap on, easy to clean and a neutral color (because apparently I have decorating A.D.D and need to paint every 6 months). I feel the same way, right now I have 29 paint color swatches on every wall. We are looking for the right sofa right now too. Thanks for the tips and thoughts. They were helpful. Blessings! Good luck with your search!!! Hope you find just the right one! Sofa shopping is sooo confusing and important! It is one of the most used pieces in our houses. Love the accent pillow you chose and can’t wait to see it in your room! Thanks, I can’t wait to see it there too! Lord, how much more stress and decision making are you going to add to your life, girl?!! ha ha. I love a sectional, although we have not owned one. I think they would be great for the teenage hangout. When we shopped for a sofa, scale was important to me and comfort. Our room has VERY high ceilings, and there are 18 ft. tall bookcases behind the sofa, so I really needed one that was not too short on the back – and long enough to lay down comfortably for a nap….all things that HAVE to be thought about when buying a sofa, right? Oh my YES, that is so important!! Too small and it looks wimpy, too big and it dwarfs everything else! Smart smart smart to consider scale! I can’t say that my decision making will end soon but I’m thinking if I get it all out of the way at once then I can just enjoy it all sooner. RIGHT? Yay! This is great! I’m actually going to be sofa shopping soon, and although my kids are older kids….I’m sure we’ll have grandbabies. And I do have dogs……two big dogs. I especially appreciated the dog barf question!! LOL Too funny! You guys have so much going on right now! WOW! The bedroom, the kitchen, and a kid room. Go Melissa! We (I) frequent a liquidation store up here in Canada. When they closed out one of their locations we purchased a LARGE red sofa and the end lounge part of a gold sectional. It is oversized as well. It is in my living room placed on an angle. I LOVE it. Everything about it. So comfortable, the color and the uniqueness of it being on its own. Problem is….ever y time hubby lounges on it he is out cold for the next hour. I also caught our German Sheppard catching a few zzzz’s…..more than once.Once a year, usually after Xmas, I move all my furniture around for a fresh look. By days end it is all back where I started. Hubby comes home and questions what I did all day. Men!!! I am myself, currently getting ready to go furniture shopping, and I want a sectional. My husband does not want to go, so I’m taking my daughter with me and he has said to get whatever I want. His only request is that I purchase a recliner for him. I’ve been doing “sectional research” till I’m crazy. Hoping I can pull this off. The ‘dog barf” question is great. I have one dog and four cats. Whew! The big question for me, is how will the cushions hold up? That is the issue with every sofa I have had. Including my last which was a Lazy-Boy. There seat cushions held up really well, but the back cushions, not so much. But, it was a huge improvement over my very expensive Ethan Allen sofa which had a great frame, but the rest of it was very cheap. I couldn’t wait to see that one go. I put it at the street just in time and it was heavy for the guys to get in the garbage truck…and then it took at least 20 minutes for the chomper to gobble it up. Like I said…great frame…but who cares if everything else wears out in a very few years. Oh…and they weren’t interested in making it right either. I hope your sofa is everything you want it to be. What a blessing!!! A couple of cushions on my lazy-boy sectional have not held up well, but (thank goodness) a side-zipper is provided to insert more filling if needed. My question is ~ Can I buy PRETTY REPLACEMENT COVERS for my sectional? It has one side chaise lounge & the other side a recliner. Wow, lots of money spending going on around there. You must have come into some money! I am jealous. Ha I wish! Sofa is free to me and my kitchen waited three years :-)and I’m trying to be as frugal as I can by reusing cabinets and appliances. If only money was growing on trees, oh what fun that would be! I love the fabric you are choosing. It doesn’t seem to feminine. I own a sectional couch from Scan Design that we bought in 2006. What I love most about it is the microfiber material. I know microfiber gets a bad rap, but I would highly recommend it for anyone with young kids. My son has spilled a plethora of fluids on it (including bodily) and I’ve managed to get the stains out even when I didn’t get to them right away (can you say tired mommy?) Good luck with your purchase. I’m sure your son and his friends will be very happy. How fun … a new sofa … for new memories. What a fabulous, thorough post on purchasing a sofa! I love that you’ve been happily sitting and napping on a Craigslist sofa for years, too. I am also in the market for a sofa… my quandary is that it must fit into a smallish room with 5 – yes 5 – entry doors. Wow that’s alot of sofa talk! My best friend recently bought a new sectional and she has 2 large dogs and is pregnant – so many of her questions/concerns were similar to yours!! I can’t wait to see the sectional in your home! I’m sure it will be wonderful. 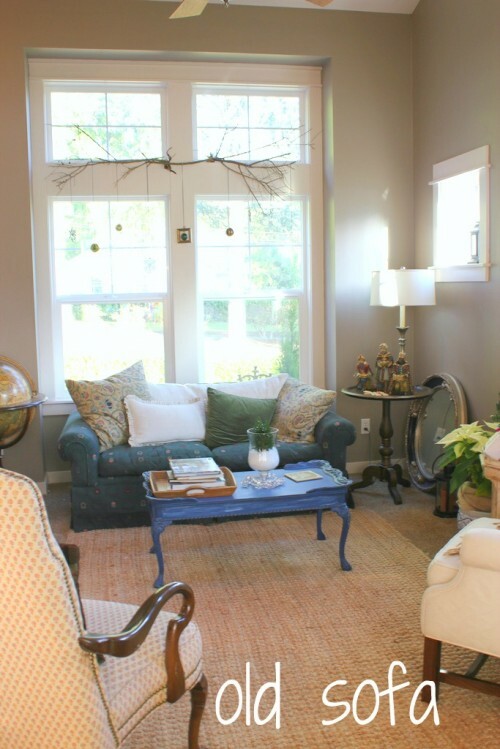 btw a client of mine has that same wicker basket on legs that you have in the photo with the PB sofa. I love it! It’s so unique! I laughed as I read your sofa obsessing post because I had a Shabby Chic sofa I bought about 25 years ago that was incredibly comfortable and looked amazingly unworn but I really wanted something more modern and chic. After years of agonizing, I walked into an ABC Warehouse sale, saw a gorgeous sectional and bought it. Didn’t measure, didn’t think about it, didn’t hesitate. When it’s right, you really know it. And when it’s a bargain too, you don’t worry about it. I donated my old sofa to the Salvation Army. I’ll be interested to find out how you like your sectional sofa as I’ve been considering one for our family room. Don’t laugh, but the sofa I have in my living room is from the 1940’s and it is a wonderful classic shaped two-cushioned sofa. It takes 4 men to move it (:() and it has springs in the cushions. It’s the most comfortable thing on earth! I like it so much that I’ve paid a substantial amount of money to have it reupholstered a few times. Great article, Melissa. Isn’t it amazing how large your old sofa looked when you first bought it, and how small it looks once it gets older and you’re looking for a new one? I thought our old sofa was large, but once the kids grew up, I realised it was actually tiny. Good luck with your La-Z-Boy; one of our longest lasting couches was one, and I must admit I was heartily sick of the thing by the time we had to replace it, LOL! I love the fabric you picked out, it’s gorgeous. It’s good you are really considering everything because it usually is something you look at for a long time. I purchased a comfortable loveseat in a microfiber fabric that is pretty much full of dog hair after my dogs sits on it for five minutes. I mean I own a pug but my other furniture isn’t like that. Anyway do not listen to a sales person who probably has never cleaned a piece of furniture in his life, I seriously should have known better, I had my doubts. Anyway good luck with your search…I am sure it will be so nice to have a beautiful new couch. My main considerations are comfort and not having to babysit the sofa (“fix” it every time it has been sat on — by sliding the seat cushions back under the back cushions, etc.). Of course it also has to be beautiful. And next time, no microfiber! Re the down cushions that need refilling… I had a couch reupholstered a few years ago and I disliked the foam cushions, but replacing them with down was too pricey. Then while browsing Amazon or Overstock I had a brainstorm, measured the cushions and ordered size appropriate down pillows. It was a fraction of the cost and easy peasy. Now they have that slouchy comfy look/feel I really wanted. I am also thinking of the same to purchase the cushions for my sofa..Can you please let me know where did you purchase the cushions? Buying a sofa is an art. You have to be very patient especially when choosing the details. Melissa, I love it! I think you (or your son or Jack) are going to enjoy it so much! My best friend has a very comfortable microfiber couch- it is just the best. Enjoy, enjoy! Great tips on what to look for and see how easy it is to clean with the above mentioned problems. I love my microfiber that is on both of my dining set chair seats. It cleans up well and easy. One note on micro fiber is that if your dog has short hair the bristles will stick into it, on the other hand where Jack has longer softer hair it will with a damp sponge wipe right off same with cat hair. I would have to see what the fabric is on my sofa which I have been very pleased with the style, comfort and fabric.. no hair on it at all. Of course I do not let my dog get up on it, but he does rub against it, and when I am laying/sitting on it backs up and sits on me. It also with the thick cushions sets up higher which is helpful to people who have problems with the couches that are so low. Mine is an Ashley from the Old Cannery in Puyallup. I have had it for a few years now and still love the set. No smashed cushions or pillows at all. Everyone comments on how comfortable is it. It is some kind of polyester blend and I have not yet had to clean it. yay! I have been sofa shopping so that when the time is right (money saved, good sale ;) ) that I can just buy it asap. My biggest thing is finding the right kind of back cushions because DH seems to totally mess up his side with the way he sits, so our current sofa looks all uneven. Love what you did with the fabric samples to test them out with real life situations! Brilliant. How is your new sectional holding up? I’m considering buying the same one. I love the configuration and price. It’s holding up well so far! It did get a couple of surface scratches in the fabric right off the bat from our dog, but honestly I never even notice them now. The velvety fabric is wonderful, so soft and cozy, and we love sprawling out on it to watch TV! My kids use the pull out bed for sleepovers and it works great too. The sofa is a little deep for sitting (we are kinda short!) so we like to have lots of throw pillows on it for extra comfort. It’s been great! Hello. 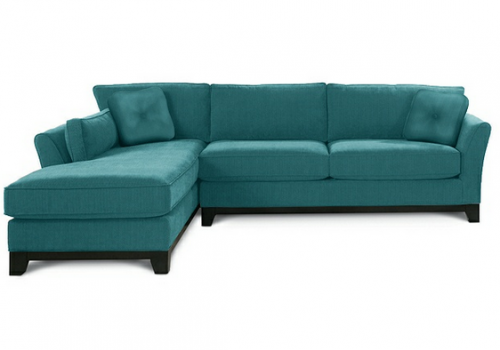 I am considering the Lazy Boy Collins Sectional for our livingroom/family room area. I am considering a soft, corded fabric that is called Buckwheat – a creamy, taupe color. I have three kids and dogs. Do you think I should consider a darker fabric since I have kids and dogs? I want a light, airy feeling for our livingroom so I don’t want to go too dark. Could you please give me the exact name and number of the upholestery you chose for the whole body of the couch? Thanks so much. I love your blog. Just found this post! And we are considering a Lazyboy sectional and need one to fit a small space but still provide lying down room. You are giving me a reason to get on this! Actually, I am lounging on it right now! We love it! Do you love the collins sectional? We were shopping at laz y boy today and are considering this one. Please let me know your thoughts! Thank you! Of the color based on the picture . Thanks in advance ! Hi Heather! The number is #C982054. Hope that helps! It’s a great fabric! So soft and durable. Hey! I am currently shopping for a couch. Had a down filled slip covered couch as well. Am also considering a sectional. What are the cushions filled with on the sectional you purchased? We want down again. Also what is the velvety fabric that you chose? Is it microfiber? We have 3 kids and 2 dogs so durability is a must! Thanks! How is the sectional holding up now that you’ve had it for three years? How is the fabric with dog fur (i.e. does it stick to the fabric like crazy)? Thanks! It’s held up really really well. Dog fur hasn’t been a problem with it at all. Our dogs did cause a little rip in the seam of one of the cushions, but it looks like it will be easy for me to fix. Other than that, we have loved it and it’s been very durable! Love your curtains, where did you buy them?